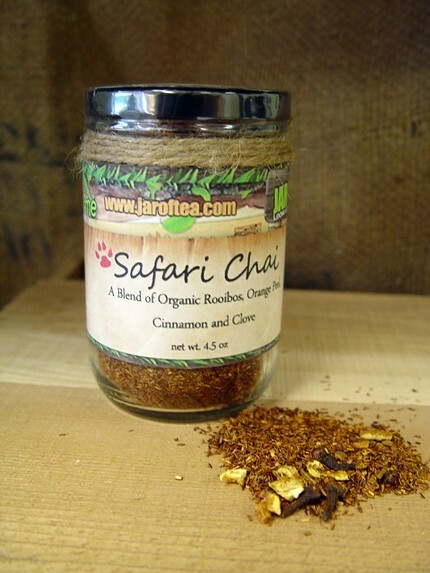 Our organic Safari Chai is perfect for that African Summer Safari! This thirst quenching spiced rooibos with orange peel, clove and cinnamon hits the spot over ice. Profile: Makes a light amber cup with the naturally sweet taste of red rooibos and a light orange mulled spice. No sweetener need with a perfect balance. The aroma of this tea reminds me quite a bit of a spicy cinnamon candy (like red-hots). I can also detect hints of orange in the fragrance – it smells really delicious! This is a very light-bodied chai – perfect for when you want a spiced tea but without the heaviness (or caffeine!) of a black tea based masala chai. Cinnamon is the most prominent flavor here and it offers pleasant warmth to the flavor, but it isn’t over-the-top spicy-hot (like the aforementioned red-hots). The orange is sweet and juicy and seems to even out the spicier notes in this blend. The rooibos adds a little bit of a woodsy note to this cup, but it does not overwhelm the other flavors – I can really taste the cinnamon, orange and clove here. Because the rooibos has a natural sweetness to it, this blend really doesn’t require additional sweetening. I like this quite a bit more than I thought I would. I drank my sample hot, but, it would make a lovely iced beverage as well – very thirst-quenching!